C. Gwendolyn Landolt graduated from the Faculty of Law, University of British Columbia, Canada and was called to the British Columbia Bar. She has had an extensive legal career in private practice, as a Crown prosecutor and as a lawyer with the federal government where she specialized in immigration and aboriginal affairs. 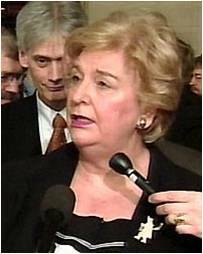 Mrs. Landolt has written extensively on Canadian constitutional issues, in particular the Canadian Charter of Rights and has participated in more than twenty five cases before the Supreme Court of Canada. Mrs. Landolt is one of the founders and is currently National Vice President of REAL Women of Canada, a national women’s organization founded in 1983. The organization is committed to the protection of the traditional family and human life, both in Canada and internationally. REAL Women is an NGO in SPECIAL consultative status with the Economic and Social Council of the United Nations. In this capacity, Mrs. Landolt, has attended and influenced many United Nations conferences in Cairo, Beijing, Istanbul, Rome, New York, etc. In addition to her responsibilities for REAL Women of Canada, Mrs. Landolt serves as immediate past President and is currently Vice-President of the Drug Prevention Network of Canada (DPNC) which works for and supports abstinence from the non-medical use of drugs. She is also a member of the board of Faith and Freedom Alliance (FFA), an organization of lawyers, which promotes freedom of religion, as well as defending family and life issues in the courts in Canada.